Architecture firm Arquitectonica and interior designer Martin Brudnizki have designed the Mr C. Coconut Grove lifestyle hotel in South Florida. The 100-room retreat, which overlooks Biscayne Bay, rises six storeys and will feature several leisure facilities and terraces, including a fitness centre, garden, swimming pool, and spa with a private sauna, treatment room, and outdoor relaxation lounge. The nautical look of the resort – as shown by its azure and white-coloured terrazzo floors and timber panelling – is influenced both by coastal Italian culture and by the pier-like Stiltsville structures located off the Florida Cape. 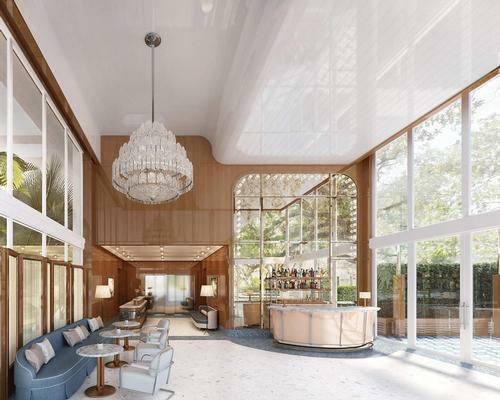 Mr. C, which takes its name from the surrounding Coconut Grove neighbourhood – will also provide luxury dining options via its on-site Bellini Restaurant and Bar. Conceived by fourth generation hoteliers Ignazio and Maggio Cipriani, the new concept will specialise in what the company has termed "rustic Italian fare". In a statement, Ignazio Cipriani, who co-founded the hotel with his brother, said: "We are extremely excited to be part of the revitalisation of such a wonderful neighbourhood known for its iconic history. "With the opening of our first hotel in Florida, we could not be more pleased to have partnered with such valued and respected entities that truly embrace the community they serve." Developed by Main Highway Partners, Mr. C is set to open its doors this spring and is accepting reservations as of 1 May.